HURIGHTS OSAKA published three books and a primer in 2013. The three books relate to two themes, namely, human rights education and human rights centers. The fourth publication is a Japanese-language primer on human rights-based access to justice. 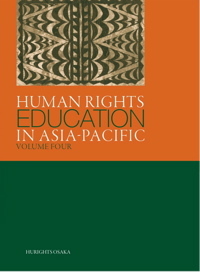 The fourth volume of Human Rights Education in Asia-Pacific came out in mid-2013. This volume contains articles relating to the following sections: sectoral education, training for professionals, formal education, and surveys and research. The articles in the volume include diverse activities and programs such as theater, legal literacy, regional award for TV programs on child rights, national human rights institution training programs, city government-supported public space for human rights project, regional training projects, international networking program, and social education program. The authors consist of people who implement the programs and activities from Asia (Bangladesh, Pakistan, Mongolia, Korea, Taiwan and Japan) and the Pacific (Papua New Guinea, Vanuatu, and Australia). The volume, as in previous volumes, has Appendices that include declarations on human rights by young people in Japan who refuse to go to school and two local governments in Japan and Korea. Human Rights Education in Asia-Pacific is an annual publication that promotes various types of initiatives on human rights education as well as related activities. 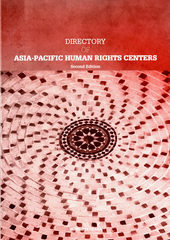 HURIGHTS OSAKA published the second edition of the Directory of Asia-Pacific Human Rights Centers. The first edition of the Directory was published in 2008. The 2008 edition profiled one hundred eighty-one human rights centers in different countries in Asia and the Pacific. The second edition has profiled more human rights centers in many more countries in Asia and the Pacific. There is a considerable increase in the number of profiled human rights centers in West and Central Asia, while a number of human rights centers that are no longer operating have been deleted from the list. An appendix lists other human rights centers that have no profile so far, yet identified as existing in many countries. The center profiles provide succinct information on the history, objectives, programs, activities, publications, and special concerns of the human rights centers. The human rights centers are generally classified into three types: non-governmental, university-based, and government-supported institutions. They cover local, national and regional (Asian or Pacific level) institutions. As defined in the 2008 edition of the Directory, a human rights center is an institution engaged in gathering and disseminating information related to human rights. The information refers to the international human rights instruments, documents of the United Nations human rights bodies, reports on human rights situations, analyses of human rights issues, human rights programs and activities, and other human rights-related information that are relevant to the needs of the communities in the Asia-Pacific. HURIGHTS OSAKA published the last in the series of subregional publications on human rights resource materials in 2013. This is the Human Rights Education in the Northeast Asian School Systems: Resource Material. 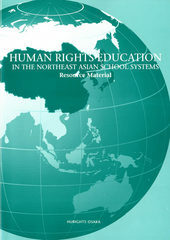 As indicated in the title of the book, the contents of this publication are drawn from the existing materials in Northeast Asia, the existing government policies related to human rights education, relevant school curriculums, and the existing government and non-governmental programs and projects on human rights education. The book highlights very concrete programs and projects being undertaken by local and national governments and by non-governmental organizations. The main content consists of human rights lesson plans on various topics for primary, lower secondary and upper secondary school levels. The book was prepared in cooperation with educators from China, Hong Kong, Japan, Korea, Mongolia and Taiwan. 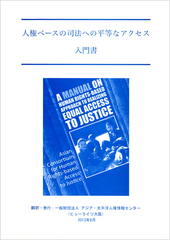 Toward the end of the 2013, HURIGHTS OSAKA published as a primer an excerpt from the book A Manual on Human Rights-Based Approach to Realizing Equal Access to Justice, published by the Asian Consortium for Human Rights-Based Access to Justice (HRBA2J-Asia) in 2011. The excerpt was translated into Japanese language. This primer, entitled Human Rights-Based Approach to Access to Justice, is part of the Northeast Asian project of HRBA2J-Asia. The primer has Chinese, Korean and Mongolian versions.